Love at first sight, it still exists! This pattern fills a void in my life: it's a simple bag with enough interest to make the sewing fun. 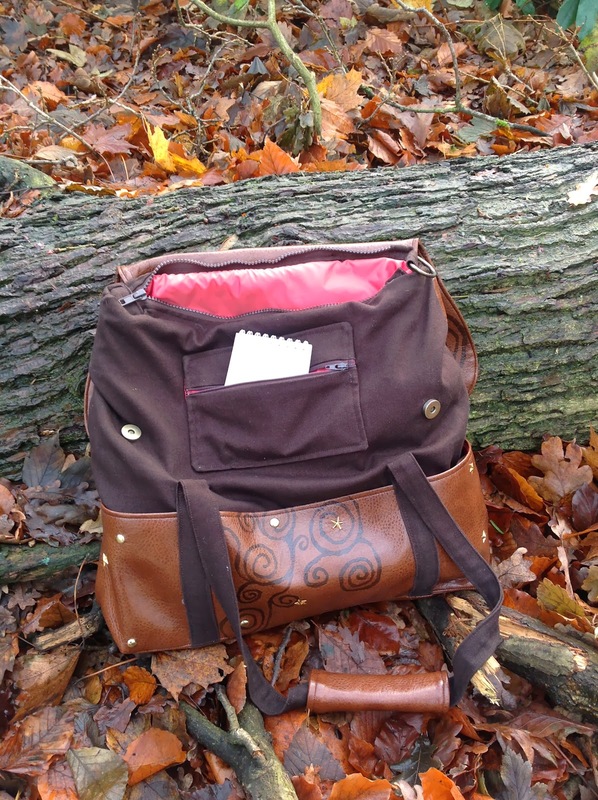 The pattern can be made up into a messengerbag, a bagpack or a bike satchel. I made version 3., the bike-satchel. 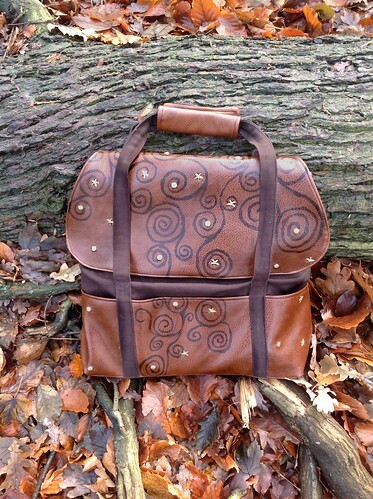 I decided to paint the faux-leather with a spiral motive and add studs to them. I left off the rivets, because they competed with the studs.This was actually much less work then I anticipated. It wasn't hard, and I'll definitely consider doing it again. 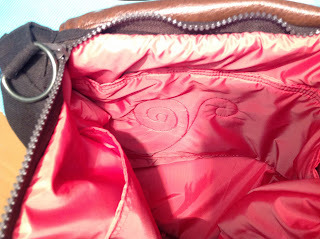 The lining is a type of nylon, very strong, waterproof and with a rich color. Perfect for lining! I interfaced it with fleece and craftfoam to give the bag a little body. The pattern does not have a zipper, which is a personal pet peeve of mine. I absolutely will not carry a bag that doesn't close safely and properly. I guess they omitted the zipper so that they did not have to label the pattern intermediary, but again, I think the pattern is for advanced beginners/intermediary sewists anyway. To protect my bike from all the hardware, I added two leather tubes to the back-straps. They slide over the clasps after you fasten them. Just make two tubes that are smaller at the top than at the bottom, and slide them over the straps before you attach the clasps. Great pattern of bag of misery? This bag is not difficult to construct, but it will be hard for a beginner to finish some parts of it nicely (straps, back). I'd rate it intermediary for that reason. I feel some essentials were missing from the construction, like proper interfacing or the option to install a zipper. 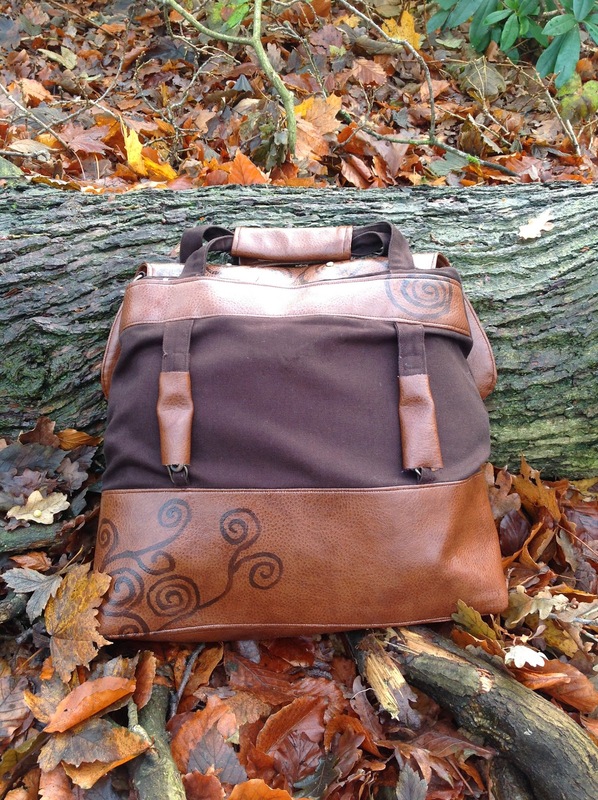 However, the bare bones of the bag are just as gorgeous as they look in the pictures. 1. if you use heavy fabrics you'd better have a great sewing machine, otherwise the final seams are all but impossible to do. Tip: Do not use your contrast fabric to line the front pockets! it will be much too thick. Use your lining fabric instead. 2. It uses some very specific hardware. Finding it might take some time. 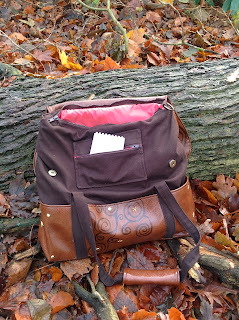 All in all it's a nice bag with lots of space for you to add your own ideas. 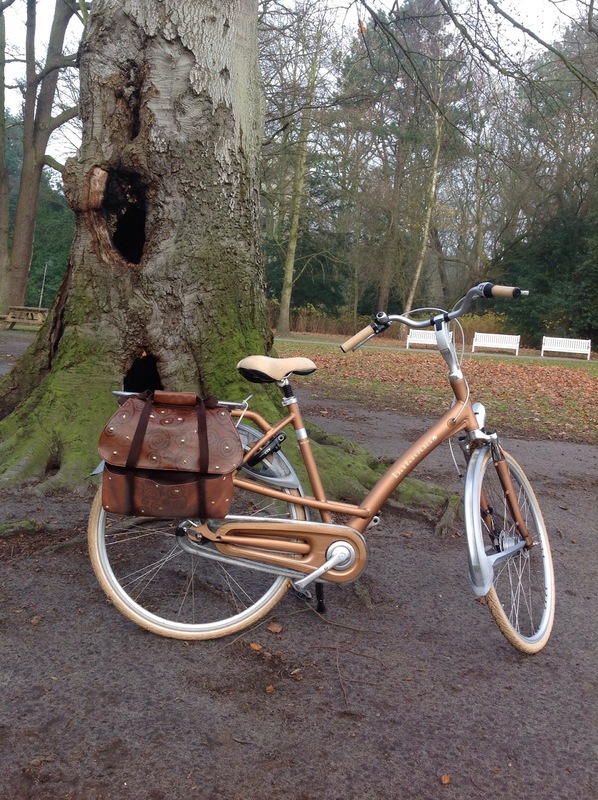 I love that I now have a bag that matches my bike!